Check Rates & Availability at BEST WESTERN Sunrise Inn! Round Valley hotels are surrounded by stunning vistas, and our Eagar hotel is a favorite for guests who want to be near the powder. Hotels near Sunrise Ski Park are renowned for being nestled close to the great outdoors. If you're looking for White Mountain hotels, choose the one whose brand and reputation you can trust. Our Eagar hotel has high Trip Advisor ratings and numerous regular, return guests. It's partly our convenient location that has so many guests returning, but our friendly staff members and spacious, clean rooms are also a big draw. There aren't many hotels in this area, so make sure you choose an Eagar hotel you can trust. Our guests enjoy visiting many attractions in the Eagar area. The Rene Cushman art collection - which includes one of the only Rembrandt sketches in the country, is featured at the Springerville Heritage Center. The nearby Casa Malpais Archaeological site is also a must see. The Arizona Outlaw Trail ATV Jamboree draws a crowd, but there's an abundance of outdoor activities to enjoy year round. With Mother Nature right in the backyard of our Eagar hotel, visitors enjoy a variety of activities including fishing and hunting. Outdoor, rustic weddings are a regular sight in this region. A Mormon settlement, there are also a number of large family reunions nearby. If you're in town for a special event, you need a quiet, well-appointed room. Business travelers especially enjoy our prime location and spacious amenities. A few regular business travelers at our Eagar hotel include employees of the local power plant, forest service, the local hospital, and school district. Whether you're just passing through, here for an event, or on business, take advantage of everything we offer. Our complimentary breakfast gets you started right in the mornings and features Belgian waffles, a variety of hot items, a selection of cereals, fruits and pastries. 100% Arabica or our full bodied 100% Columbian coffee and chilled juices. From: Highway 60 East. 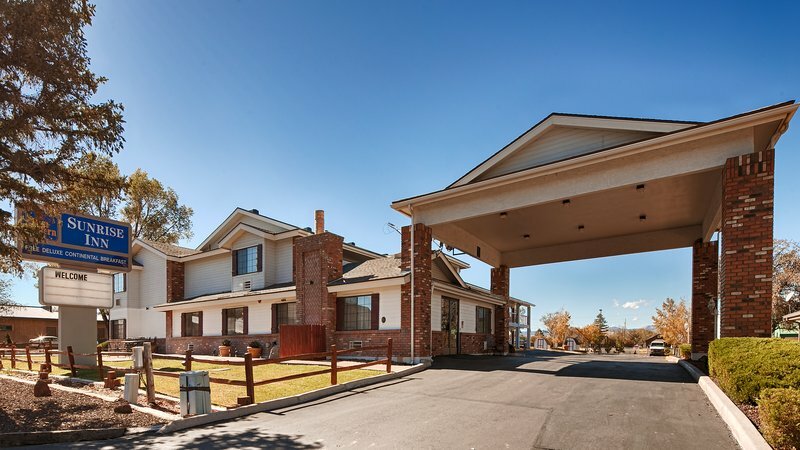 The Best Western Sunrise Inn is located in the center of Eagar. Take Highway 60 East to Springerville and travel south at the stoplight. From Interstate 40, exit at 286 South to Highway 180 East. Take this to Springervile and turn south at the stoplight. The Best Western Sunrise Inn is located in the Round Valley.